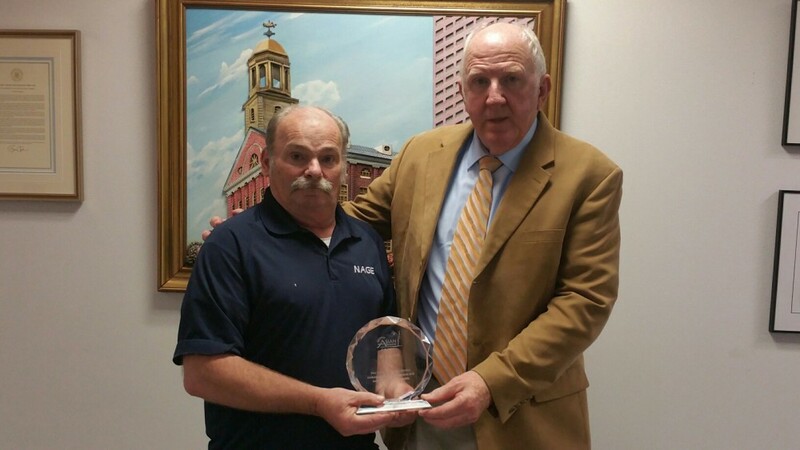 Long Time NAGE staff member John Sampson, was recognized last week for over 10 years of service to Quincy Asian Resources, Inc (QARI), an organization who helps the large Quincy Asian population acclimate to life in the United States. John Brothers, QARI’s Executive Director presented John with the award. NAGE allowed QARI to use their facilities after hours for over a decade and NAGE staff member John Sampson stayed late to accommodate the English as a second language courses they provide. The service is crucial to Quincy residents, 26% of whom identify as Asian and many of them are first generation immigrants. QARI recently received a grant which allowed them to move their classes to Hancock Street in Quincy and is no longer in need of NAGE’s facilities. NAGE is lucky to have a caring member of the community as a staff member, thank you John!